Sweet caramel, dense chocolate, spice box and dried fruit with abundant crema and syrupy smooth body. We carefully roast and blend this coffee to bring out the finest qualities in espresso coffee. When properly extracted the Decaf Barrington Gold yields unctuous crema and a complex lineup of bold flavors followed by a long, smooth finish. To attain this perfection, we begin by sourcing coffees that are naturally very low in acidity and extraordinarily high in body. Our proprietary blend includes aged and conditioned coffees from Southeast Asia and South America. 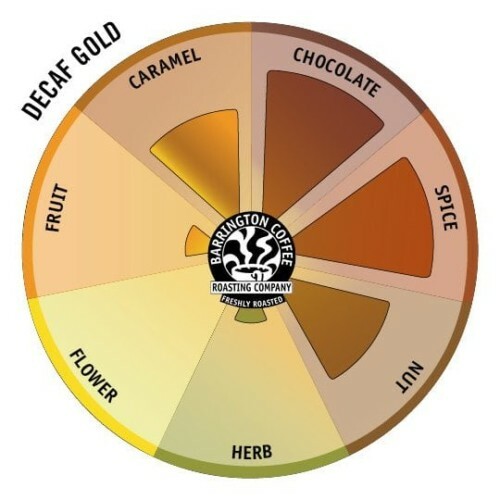 Though we are mindful not to fully disclose the components of this blend, there are some unique aspects about the Decaf Gold that we would like to share with you. Critical components in the Decaf Gold include carefully conditioned monsooned coffees from Southeast Asia. Monsooned coffees are green coffees that have been allowed to absorb the moisture of the monsoon winds after picking. The seeds expand as they absorb the moisture, the cells rupture and then they are dried for export. Numerous chemical compounds in the seeds are altered in the process, but the overall effect is a profound decrease in the coffees acidity. This blend also includes coffees that are part of our Landed Aging Program™ whereby we further soften the green coffees acidity through storage in a relative humidity controlled environment. The conditioning and aging processes we employ are risky, labor intensive and very costly. 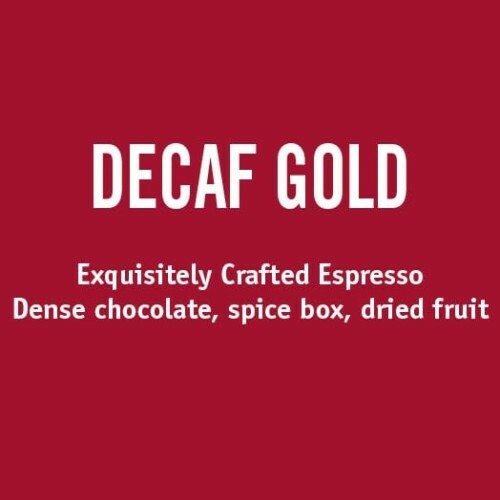 Yet they are central to the identity of the Decaf Gold. When the otherwise delicate flavors of these coffees are concentrated through the high pressure extraction of an espresso machine, the qualities are magnified to an essential level. The Select Water Process removes caffeine from the coffee bean without the use of harmful chemicals or byproducts. We are big proponents of this process because it quite seamlessly removes the caffeine and leaves all of the great coffee flavor. Thanks to the Select Water Process, we are able to create not only a truly a delicious espresso, but also a decaffeinated book match version of our Barrington Gold Espresso Blend.